All you need for trading on Betfair. Multiple staking plans, fully automated system. Save your time, let the smart bot make money! More than 30 staking plans, unlimited number of instances, import and export to Excel, virtual bets, stop loss, recovery, statistics and more! Our video tutorials demonstrate how to use all common functions of Betsender. Learning have never been so simple! Not certain yet? Read what other people think about Betsender. Learn what benefits it gives. Betfair bot and software which can fully automate your betting strategy. You can leave Betsender running on your computer and the bot will automatically calculate all the bets following your betting system and place the bets on Betfair. 19 backing and 19 laying plans are available at the moment. Run virtually unlimited number of instances of the Betfair bot. See our Features for all details. Start your free 7 day trial right now. Version 1.4.5 is released which supports recent Betfair API changes. Download! Version 1.4 is out! Follow the top tipsters from Racing-Index on auto pilot, take BSP prices, place bets on multiple selections in the same race, schedule computer shutdown, load multiple US, AUS, UK races and greyhound, test your strategies in simulation mode, export & import your bets to/from Excel, automatically download and install updates. Now everything this is possible in our simple to use Betfair bot, Betsender. New Bookies Bank plan available. Download! The bot can be installed on any number of computers using the same Betfair account. Install it at home and at work or on your laptop! Betsender has an easy to use interface connecting you to exchange markets at Betfair. The bot makes it possible to select races and runners you want to bet on in two clicks. After you have set up the software and loaded your bets, the bot will handle all stakes calculations and place bets accordingly to your settings. Relax and watch how it does all the job for you. Try Betsender for 7 days free of charge. Then if you like the bot you should purchase the license. We encourage you to download and try our betting bot before you buy. This way you can ensure that it meets your requirements. 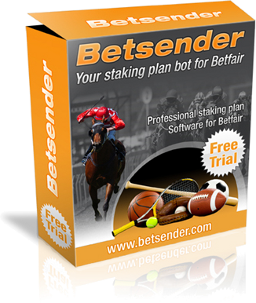 Betsender is fully automated betting bot for Betfair. Unlike many other software it has numerous staking plans and betting conditions on board. You can leave Betsender running on your machine for whole day and it will handle your betting strategy. Stop at profit/loss and stop after winner/loser triggers. Can be set as absolute amount or percentage of bank. Scheduled actions. Restart staking plan or shutdown computer when target profit is hit or after last race. One license is valid for multiple computers, install the Betsender bot at home and at work! Run virtually UNLIMITED number of instances using the same Betfair account! Backing Plans: Level Stakes, 1326, Fixed Profit, Percentage, Dalembert, Fibonacci, Sqrt, Parlay, Progressive, Pro, Retirement, Secure, Up Down, LP28, Labouchere, Recovery, Martin, Bookies Bank, Kelly’s, XYZ, 1 Point, Accumulator. Laying Plans: Level Stakes, 1326, Lay Percentage, Dalembert, Fibonacci, Fixed, Parlay, Progressive, Secure, Sqrt, Up Down, LP28, Labouchere, HiPro86, Recovery, Martin, Maria, Lay 1-4, Kelly’s, XYZ, 1 Point. HorseTips.com.au, Betsender Lays (Live and Morning), BettingTools.co.uk tips. Can’t find a staking plan you are looking for? We can add any custom system into the bot on request just in 24 hours. Contact us and send your requirements. Please see our PDF guide for the full reference of Betsender features and betting options for Betfair. Here you can download the installation of Betsender. Please, note that the bot requires Microsoft .NET Framework 4.0 installed on your machine. You can evaluate Betsender bot for 7 days free of charge. After download is complete, run the installation and follow all instructions to install the software on your computer.